“Halloween,” I wrote on my Facebook page. “A preschool party, 1st grade party, school-wide party, and 2 trunk-or-treat events. Good grief! This is getting to be as expensive as Christmas!” Halloween is a growing industry in the U.S. According to one survey, Americans spent $3.29 billion* on Halloween in 2005; this year, it is projected that we will spend more than double that amount. My family definitely spent more money on Halloween this year than we have ever done in the past and I was beginning to resent it. I’ve always had this vaguely guilty feeling about participating in Halloween at all; spending more money just made me feel worse. Why did I feel guilty about participating in Halloween? Because I grew up with a community of faith that offered “harvest parties” and “Halloween alternatives” around October 31st. 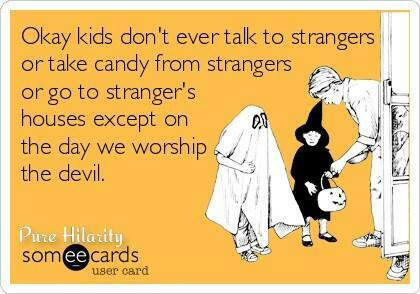 There seemed to be this belief that Halloween honored the devil. Scriptures like “Do not give the devil a foothold” (Ephesians 4:27) were quoted. Here’s the problem: My church – a 3-year-old new start church – is smack dab in the middle of a neighborhood. My neighborhood. The church building, purchased from a previous congregation, has stood in the center of this neighborhood for 55 years. People walk right past it when they’re out trick-or-treating; some even cut through the parking lot. Until 2011, there was no activity at the church on Halloween. On “Devil’s Night” (October 30th) a few church folk would huddle inside, doors locked, to drink coffee, visit, and make sure neighborhood kids didn’t vandalize the property. But the next night, when hundreds of people were walking past…Nada. No signs of life from the building with the tall, lighted spire. Nothing, from a place that should have been extending hope and help to the community. Then along came the new congregation – eager beavers, ready to love-up the neighborhood for Jesus. We threw open the doors and…Well, let’s just say, the neighbors didn’t exactly come running. They barely even noticed that there was a church in their vicinity. Since that time, Trunk-or-Treat has become a huge outreach activity for us. On Halloween, we line our cars up in the parking lot, decorate our trunks, and hand out candy to 200+ kids and their parents as they pass by. And yes, I felt vaguely guilty the first time (because of the devil-worship thing) but I participated anyway, believing that God could do something good with our efforts no matter what day it was. Last year, a family who doesn’t attend our church on Sundays (but does participate in a martial arts class offered during the week) volunteered to put up Halloween decorations for us. And I don’t mean a few pumpkins. I mean, they-own-a-haunted-house-business decorations. Tombstones. Skulls. Ghouls. Cobwebs. Inside the church building. “Oh, man,” thinks I, Mrs. Harvest Party. “This is getting out of hand. Maybe we really are giving the devil a foothold.” And I felt vaguely guilty, but I participated anyway, believing that God could do something with our efforts no matter what’s inside the building. As I saw the decorations going up again last night, I briefly shuddered. But then I realized something: This family volunteered their time and shared something that is valuable to them. They were reaching out to partner with us, the eager Jesus geeks. I should be thanking God for them because yes, in fact, He IS doing something with our efforts. “Halloween means All Hallow’s Eve which is part of All Saints Day. The holiday has many connections to Xnity. The pagans feared death and the grave. During the change of season after the harvest, the pagans believed the veil between the living and the dead was at the thinnest point of the year and the dead could cross over into the realm of the living. Many of today’s Halloween traditions are based on pagan rituals centered around those superstitions and fears. I am excited to celebrate The Resurrection this week. Bring on the witch’s costumes and ghost decorations.Those traditions are rooted in fear. But as the writer of Romans asked, “If God is for us, who can be against us?” (8:31). The Great Ghostbuster is on the job! *My original post incorrectly stated that Americans spent $3.29 million on Halloween in 2005. I apologize for the mistake and thank my husband/proofreader for the critique. If you were raised in the church, you may struggle to be honest with these things. Thanks for sharing.